Clint McKay insists Nottinghamshire will know they have been in a game when his Leicestershire side visit Welbeck on Sunday May 7 – despite their lack of big-name stars. While the hosts will have a number of players who have international experience to call on, their neighbours’ squad is far less well known. Even so, former Australia paceman McKay, who has taken over as skipper for the 2017 Foxes Royal London One-Day Cup campaign, is optimistic his side will be competitive. They will certainly hope to challenge Notts more than Warwickshire and Derbyshire, who were swept aside in games at Sookholme Lane in 2015 and 2016 respectively. “Whoever they pick and whoever is available due to international commitments, they will have a quality side with a lot of match-winners,” said McKay. 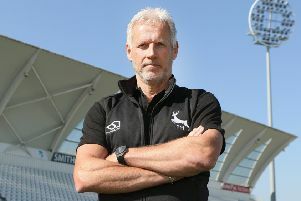 “The bowlers have already shown what they can do this season in the County Championship matches and then they have explosive batsman like Riki Wessels and Michael Lumb as well as Samit Patel, who, aside from his batting, can cause problems with his left arm spin. “I don’t think any of our lads are under any illusions as to how tough it will be, but we have some very good quality players too. Ben Raine has been in excellent form at the start of the season and Zak Chappell is a young bowler who bowls with good pace. “In the batting, Cameron Delport can hit the ball as hard as anyone I’ve seen in the world and Mark Pettini has already proven he’s a class batsman in the games he’s played so far – and I’m sure he can take that into one-day cricket. McKay, 34, is convinced that playing the Royal London games together in a clutch will help his side come to terms with the task in hand. In some past seasons, 50-over games have been contested around County Championship matches. He added: “The way it’s set-up is good for us because it allows younger players to settle into white ball cricket rather than stopping and starting.